HOUSTON (KTRK) -- Valentine's Day is a popular day to get married and Houston is getting prepared. Harris County Clerk Stan Stanart's Office is preparing for the annual surge of marriage license applications for Feb. 14. Three years ago, Stanart personally redesigned the marriage license for Harris County to reflect an 1800's romantic style flair, for which the design received statewide recognition. "Matrimony is one of the world's oldest traditions and we are pleased to provide a document that celebrates the memories of one of the most important days of a couple's life," said Stanart. "Valentine's Day is a great time to tie the knot and our clerks are happy to assist couples in obtaining their licenses at our downtown office, or at any of our nine branch locations within the county." In 2016, more than 38,000 marriage licenses were issued in Harris County. For those who are already married, you can receive a unique document to celebrate. 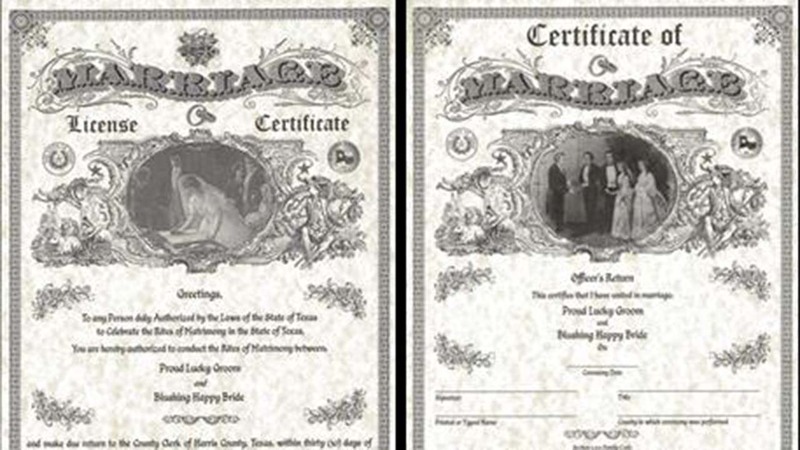 "The unique Harris County 'Certification of Marriage' Certificate not only certifies that a couple's marriage license is legally filed with the County Clerk's office, but provides an excellent anniversary gift suitable for framing," said Stanart. "Whether you've been married 5 years or 50 years, you can surprise your spouse by purchasing a 'Certification of Marriage' Certificate, frame it, and present it to them on Valentine's Day as a gift from the heart." Couples may apply for a marriage license at any of the 10 Harris County Clerk's offices. For more details see: www.HCCountyClerk.com.